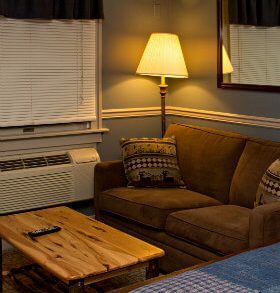 For your relaxing vacation at Lake Naomi in the Pocono Mountains, reserve our tranquil Blue Waters Cabin Suite. 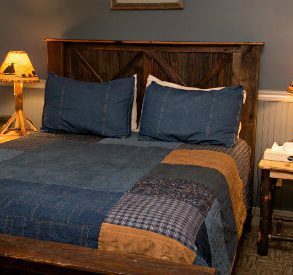 Decorated in calming blues and rustic browns, this suite offers a peaceful night’s sleep in a unique barn wood framed queen bed. 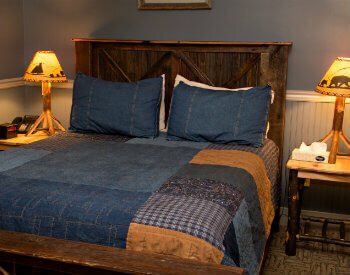 The bed is outfitted in super soft Comphy brand sheets and a denim and suede comforter. Matching end tables flank either side of the bed and the digital clock with USB ports and additional outlets gives you plenty of space for your electronics. The other half of this room offers a sitting area with a couch and coffee table. 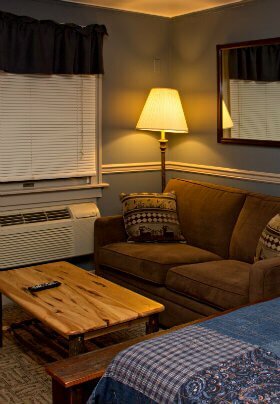 It’s the perfect spot to snuggle up and watch your favorite television show on the flat-screen TV. A warming fire burns in the gas fireplace that is turned on with the twist of a switch — what could be easier! 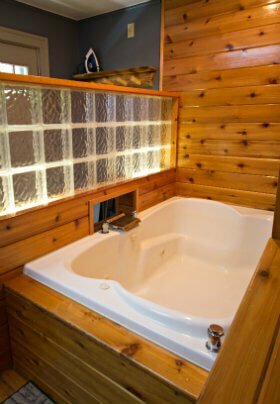 If you really want to relax away your cares (or sore muscles from skiing down one of the many nearby slopes) there’s a two-person Jacuzzi tub as well. Tucked into the corner of this room you’ll find a mini refrigerator. A four-drawer dresser sits under the television and behind the main door is a shelf with pegs giving you space to stash your belongings. The private bathroom includes a pedestal sink, shower stall, toilet and plenty of storage space on the built-in shelves. We supply a hairdryer, thick Turkish towels and Lather brand bamboo lemongrass bath amenities. 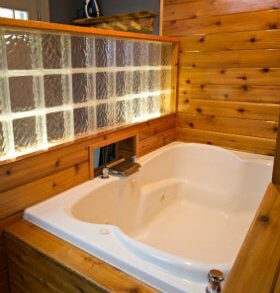 “Blue Waters” (Queen Jacuzzi Cabin #2) Room rates are based on two guests, additional guests over the age of 5 are $25.00 each, per evening. 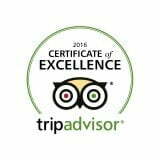 Please note that although this Cabin Suite can accommodate up to four guests by using the full-size couch bed, it is best suited for two.